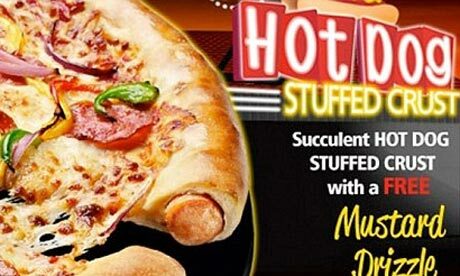 Earlier this month, Pizza Hut unleashed introduced the new Hot Dog Crust Pizza, available only in the U.K. Amazingly, the American buzz around this unholy culinary hybrid has almost exclusively focused on the fact that it’s available in Britain, but not in America (rather than the more disturbing fact that it is available on Earth). Some critics are taking a smug, undeserved pride in the fact that drunken rugby fans, not drunken NFL fans, are stuffing their guts with a pizza crust stuffed with processed pig taints. Other pundits have expressed concern that America is losing its edge. Why, they ask, do Her Majesty’s Fast Food Consumers have exclusive access to the next generation of that most American of all culinary innovations—putting one crappy food inside another crappy food, “fry-baking” the whole thing, and serving it up with a condiment that resembles radioactive urine. Analogies to the Cold War arms race abound in discussions of this nuclear-level calorie bomb. The fact that an American company introduced this revolutionary “eatertainment” product on foreign soil just adds insult to injury, if we’re to listen to the folks at Fox News. You’d think Pizza Hut was selling uranium to a hostile nation (wait…aren’t the North Koreans mining for enriched Mustard Drizzle?). But, seriously. Are we really at risk of lagging behind in the global race to use processed pig anuses in profoundly inappropriate ways? The short answer: no. Our country is still a shining beacon of hope for those unfortunate nations burdened by the harsh tyranny of self-control. For God’s sake—Americans are the pioneers of the organized sport of Competitive Eating. But we're not just about quantity, when it comes to crap.We believe in originality. We even put our gross-things-in-other-gross-things on a stick, so we can eat them while driving to Costco.That, my friends, is innovation. This Pancake-wrapped sausage sez: USA #1!!!! My prediction? This is a brilliant publicity scheme on the part of Pizza Hut, to create a buzz for the release of their upcoming Extreeeeeeme™ Stuffed Krustz!!!™. In the American version, I predict they’ll take it to the next level. 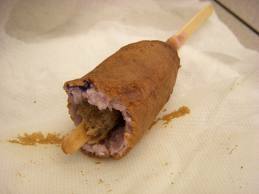 The crust will be stuffed with hot dogs, but the hot dogs will be stuffed with a deep-fried Turducken ... that’s also stuffed with Snickers bars! Oh, yeah, baby. We’ll show those limey bastards who’s #1 (SPOILER ALERT: it’s the USA!). We’re #1, dammit! Maybe not at math, or neonatal outcomes, or even literacy rates, but…we’ve still got gluttony (and reality shows, and reality shows about gluttony). And we’re not letting go.